Randstad, a global staffing and HR solutions company have came out with a comprehensive report on Employer branding and Employee perceptions in India. The survey captured views over 2 lakh respondents for India’s largest employers (more than 1000 employee companies). According to the report, Microsoft remained the most attractive company for fourth year running with over 89% of respondents saying that they would like to work for the company. Google India came in at 2nd spot with 86% and Sony came in at 3rd with 85%. As far as the name awareness of the companies goes, ICICI came out on top with 70% of respondents knew the company enough to have an opinion/perception about it. SBI (69%) came in at second followed by Wipro (66%). 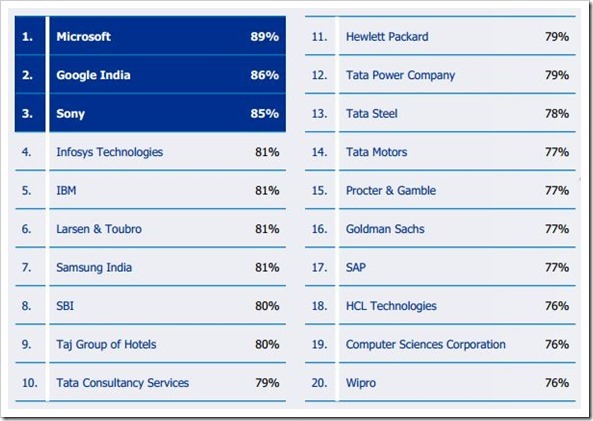 HDFC Bank (65%) and Sony (65%) completed the top 5 list of most know companies. The report offers number of insights on Employee branding and employer perceptions; here are a some of the important highlights of the report. salary remains most important factor in India before job security, followed by employer’s financial health. Potential employees see “Company Honesty” as the most important characteristic followed by reliability, Security and intelligence of the company. 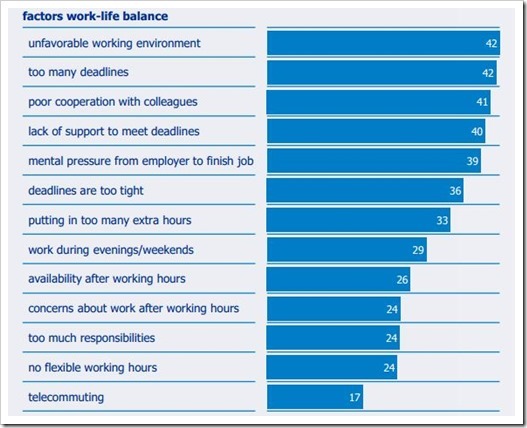 “Unfavorable working environment” and “too many deadlines” are the most important factors that affect employee work-life balance. On average, Indians spend 52 minutes to work and indicate that 49 minutes is the average acceptable travel time. On average, Indians think they have to work up to the age of 56, which according to them is also the ideal retirement age. 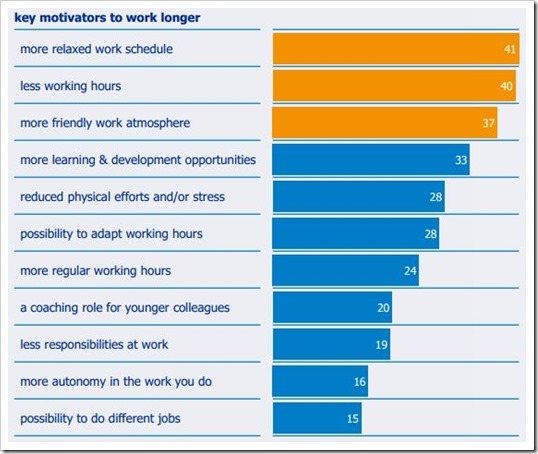 “More relaxed work schedule” and “Less working hours” are the 2 key motivators for employees to work longer in years of service. Indians aged between 18 to 24 find Sony as the most attractive employer, while people aged between 25 to 54 find Microsoft most attractive. Indians above 55 years find HP most attractive to them. “IT, Communication, Telecom & ITES” is the most attractive sector for employees, followed by FMGC and then Auto sector. You can find Download full Randstad Award 2014 report here.